There are hundreds of traffic infractions on the books. Even an experienced DUI attorney won’t be familiar with all of them. But the officer must be able to point to a specific statute as authority for the stop and explain how the driver violated the statute. Otherwise, an experienced DUI lawyer can potentially get the charge dismissed. There are generally two types of traffic infractions: bad driving or problems with the car itself. Bad driving examples include speeding, not using your turn signal, and not stopping at stop signs or red lights. Problems with the car itself can include expired registration, broken headlights, cracked windshield, or not properly titling a vehicle after purchase. So if you drive safely in a car that is properly “street legal” you shouldn’t get pulled over. It doesn’t matter if you have fifty pounds of drugs in the car or have a couple of drinks. Nevertheless, police make mistakes and sometimes they stop a car without lawful authority. This is one situation where a good DUI lawyer can help. Perhaps the most litigated reason for a stop is where the officer pulls a vehicle over because he or she believes the driver is committing or recently has committed a crime. In order to pull a vehicle over under reasonable suspicion of criminal activity, the police must be able to convince a judge that articulable facts caused them to reasonably believe that the vehicle occupants had committed a crime, like DUI. A diligent DUI attorney can sometimes have a judge rule that a police stop was invalid based on a lack of credible, articulable evidence supporting the reason for the DUI stop. Reasons for this can include, unreliable tips from others, false assumptions, unreasonable inferences about the evidence and more. In practice, the art of attacking a DUI stop is extremely complicated and requires hours of dedicated legal research. Such work is often better left to a seasoned criminal defense attorney who already has years of experience in this area. When an officer first approaches your vehicle, whether under belief that you’ve committed a traffic infraction or whether he believes you may have engaged in criminal activity, the scenario will likely start the same. 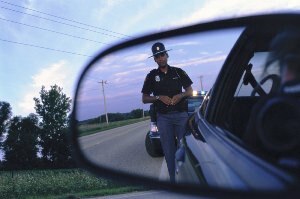 Most often the officer will ask for your license, registration, and proof of insurance. By law, you must produce these items when pulled over, so it pays to have them handy for the police officer before he or she approaches. From the word go, the police officer will pay careful attention to everything going on in your vehicle, not only for his or her own safety, but to gather evidence of any possible crime, like DUI. The officer will try to observe whether you smell of alcohol, slur your speech, have red, glassy, or droopy eyes, fumble for your license and registration, forget to provide him the proper paperwork, try to give him the wrong items (like a credit card), and more. He may also look around to see if there is alcohol or drugs in plain view within the vehicle. Because you have only been stopped for a traffic infraction or because the officer believes you may have committed a DUI based of some other information, you are not under arrest at this point. The officer will try to gather as much information about whether you are impaired by alcohol or drugs as he or she can. If the officer sees any of the normal signs of DUI impairment above, he or she may also ask you if you’ve been drinking or taking any drugs. The officer is asking you to incriminate yourself. First off, don’t lie to the police; it is a crime. However, just because you shouldn’t lie to the police doesn’t mean you have to answer police questions. You, I, and everyone else enjoy the right to remain silent under the Constitution, so the most appropriate answer to this question is, “I want to remain silent and I want to talk to an attorney as soon as possible.” The officer must stop asking you questions at that point. Additionally, your refusal to answer questions cannot be used against you in court. This doesn’t mean the officer will stop the investigation, but the officer won’t be able to rely on you doing his job for him. “I want to remain silent and I want to talk to an attorney as soon as possible.” – The best answer to police questioning. This answer beats the alternative. If you say that you haven’t been drinking, but a later breath test shows you have, you will lose credibility with the court and a jury at trial. Rather, simply refusing to answer is perfectly OK. Don’t be concerned that your noncooperation might make the officer angry, because he or she wasn’t going to invite you to Christmas dinner regardless.